Somehow everything seems perfect after a snowfall. The world is a beautiful place. Hushed. Safe. Magical. Even now, as a grown-up, I love to yank on my boots and romp through the fluffy stuff in my Brooklyn neighborhood. That’s why The Snowy Day by Ezra Jack Keats — the classic story about a boy named Peter who goes outside to play among a blanket of white in his city neighborhood — has always been my favorite picture book. I was born in the inner city in 1963, the same year Ezra Jack Keats won the Caldecott medal for The Snowy Day. I’m thankful I came into this world with that book to greet me. My parents were newlyweds with very limited financial resources, but they purchased The Snowy Day for their daughter. Ezra’s vision of what a children’s book could be held such promise at a time when there was huge social change in America. That year, Martin Luther King, Jr. delivered his landmark “I Have a Dream” speech. Weeks later, four African-American girls were killed in a racially motivated bombing at the 16th Street Baptist Church in Birmingham, Alabama. On the one hand, thanks to Dr. King’s dream, there was great hope on the horizon. And yet, like a dark cloud, so much anxiety and uncertainty hung in the air around the unimaginable deaths of those little girls. In the midst of it all, there was Peter, the exuberant African-American boy in The Snowy Day. That adorable kid explored his urban neighborhood with such joy. And while a picture book can’t ever erase a tragedy, Keats’s story and colorful illustrations somehow made our troubled world feel better. Though The Snowy Day never mentions Peter’s skin color, it was the first mainstream book to feature an African-American child. And when, like a beautiful snow, that book fell into our lives, we celebrated. Back then, I didn’t fully realize that Ezra Jack Keats had transformed children’s books. I only saw what I saw, which was a reflection of my brown-skinned self, celebrated through Peter’s sense of wonder and discovery. I think I slept with my copy of The Snowy Day. That’s how much the book meant to me! It was like a bed pillow. There’s so much solace in that story. All these years later, The Snowy Day is still a book I share with my own son and daughter, even though they’re now young adults. That’s because comfort and fun never go out to style. When Peter puts his snowball in his pocket, we still giggle. 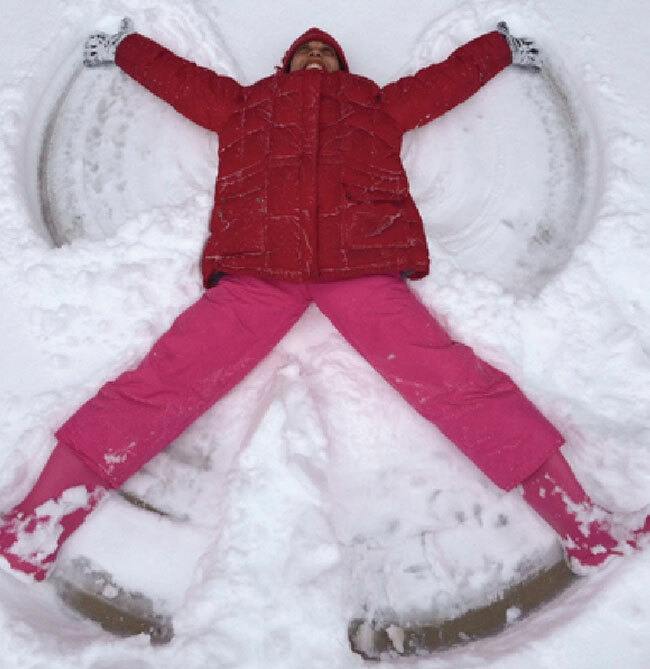 Author Andrea Davis Pinkney enjoying her very own snowy day. It’s the giggles and family book-sharing that make The Snowy Day and all of Ezra Jack Keats’s books so special. As the 100th anniversary of the birth of Ezra Jack Keats approached this year, I, like an eager kid preparing to leap onto a sled, jumped at the invitation to write a book for children about him. In the poem, which introduces us to Ezra Jack Keats’s childhood as a struggling immigrant growing up in Brooklyn, Peter’s presence is stitched throughout in a “peek-a-boo” fashion, waving at readers. Collage artwork by Steve Johnson and Lou Fancher echo Ezra Jack Keats’s visual rhythms by playing with bold color and shapes, in the same way Keats did with his paintings. As a Brooklynite, I feel a special connection to Ezra Jack Keats and the communities his books celebrate. When I step out my front door, it’s as if I’ve walked into Keats’s world. Every day, I see kids like Peter and his friends coming and going. The boys and girls in my neighborhood are the ones whose lives and experiences are beautifully reflected in the city scenes Ezra Jack Keats created. Keats brought beauty to street corners, front stoops, graffiti, manholes, and storefronts. He rejoiced in showing black and Latino children and families, immigrants, homeless people, and workers from all walks of life. Here we are, 100 years after Ezra Jack Keats was born, and kids and parents are still rejoicing! To me, a great book is like snow. It doesn’t care where you live or what color you are. It loves everyone equally. Snow is nature’s we-all blanket. When Snow spreads her sheet, we all glisten, we all shine. That’s what books do, too. They show us we all matter. Andrew Davis Pinkney is the distinguished and bestselling author Brightly’s Book Club for Kids pick A Poem for Peter: The Story of Ezra Jack Keats and the Creation of The Snowy Day, a beautiful picture book biography of the legendary author and artist Ezra Jack Keats. Click here to learn more about Brightly’s Book Club for Kids, discover activities and tips for discussion inspired by A Poem for Peter, and join in on the reading fun.